The American Cinematheque present “Attack of the Giant Screen,” a festival of B-movies at the Aero Theatre in Santa Monica and the Egyptian Theatre in Hollywood. Things kick off on November 5 at the Aero, with Tim Burton’s bopic ED WOOD. The B-Movie madness wraps up at the Egyptian Theatre on November 9 with THE LOST SKELETON OF CADAVRA (2004), followed by the Los Angeles premier of its sequel, THE LOST SKELETON RETURNS AGAIN (2008). Both flms will be followed by discussions with the cast and crew. Get info on the Egyptian screenings here. Below is the complete schedule for the Aero Theatre; all screenings begin at 7:30pm. Description: The film biography of the worst filmmaker ever launches the American Cinematheque's B-Movies Attack festival. 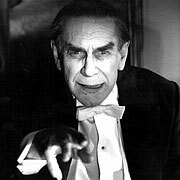 After the screening, actor Martin Landau, who won an Oscar for his role as Bela Lugosi, will discuss the film with screenwriters Scott Alexander and Larry karaszewski. Description: Giant ants and a giant bird are double billed. Description: A double bill of '50s sc-fi. Description: Two movies about rampaging beasties. Description: The final double bill of giant monster mayhem. You can find more information about the Egyptian and the Aero on our Theatres page.